Being humans, we tend to mishandle many things and the most mishandled thing is our smartphone. Each one of us must have dropped their iPhone at least once. But we are not lucky all the time. In some cases we end up with a broken iPhone. And the most precious data that we lose after breaking an iPhone is pictures. All we can do is regret for breaking our iPhone and no longer have our precious pictures. And today, in the below article, we will be discussing easy and simple ways to know how to get pictures off a broken iPhone XS/XS Max/XR/X/8/8 Plus/7/7 Plus/6S/6/SE/5s/5. As you have entirely broken iPhone and it is in not-so-good working condition, you need some serious solutions to get back your pictures from it. Hence, today in below article, let's have a look at some how to get your pictures off a broken iPhone. When you are in big dilemma of broken iPhone and you don't know how to recover photos on it, simply try Tenorshare UltData. The software is the best tool you can use to retrieve all your pictures in an easy way. Follow below steps to know how to retrieve photos from broken iPhone. Step 1: Connect iPhone with your system (PC/Mac) using a USB cable. The software will automatically detect your iPhone. Now choose recovery mode. Step 2: When the recovery mode is chosen, a scan is required to find the pictures on your broken iPhone. So tap on Start Scan to start the scanning process. Step 3: The pictures will now be displayed. You now simply have to choose the pictures you want to retrieve. Congratulations. You can get photos off iPhone broken screen. 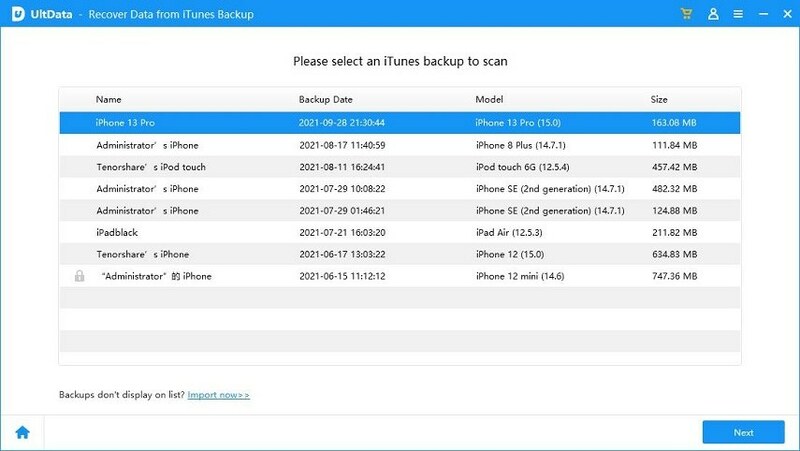 If Way 1 doesn't give you satisfactory answer for your question how to get photos off broken iPhone, you can simply retrieve your pictures from iTunes backup. Note that you can use this method if you have at least once backed up your pictures via iTunes. And hence to get off pictures from broken iPhone, use iTunes backup recovery mode of Tenorshare Ultdata. With this method, you can get back your pictures from iTunes backup effortlessly. Follow below steps. Step 1: You just need to switch to Recover from iTunes backup files option from normal Recovery Mode. Select the latest iTunes backup from which you wish to retrieve the pictures to start the process. Step 2: A list will be displayed that will give you all your pictures from the broken iPhone when the scanning is finished. Step 3: Simply select the pictures you want to recover. You can recover photos to your PC itself. If in case you have backed up your photos using iCloud, you can retrieve them using Tenorshare iPhone Data Recovery (Ultdata) iCloud backup recovery mode. This will no doubt retrieve your pictures from broken iPhone. Follow below steps to know how to get pictures off iPhone with broken screen. Step 1: Switch to Recover from iCloud backup files mode from the default normal recovery mode. With the help of your Apple ID and password, sign in to iCloud. If already logged in, simply choose Software Access option. This will allow you to sign in automatically. Step 2: Here, all your iCloud backups list will be seen. From the list, select the most recent backup. Step 3: Select Photos option since you want to retrieve pictures. Tap on Next. The process will start and all the pictures will be listed when the process is done. Step 4: Choose the pictures you want to retrieve and the place where you want to save the retrieved pictures. Having a broken iPhone screen is way too sad. We know that! But com'on you cannot just sit and cry for it forever. It is not a good thing though, but surely you can do something for it. Simply repair it. There are options out here. Choose the one you are comfortable with. In the above article, we showed how to how to get photos off your iPhone with a broken screen. Along with it, we have also discussed how to repair your broken iPhone. Tenorshare iPhone Data Recovery software is highly recommended as it will help solve your issue in no time and with ease. It will not help you retrieve pictures but also other important data from your broken iPhone XS/XS Max/XR/X/8/8 Plus/7/7 Plus/6S/6/SE/5s/5. Share your valuable feedback by commenting below.